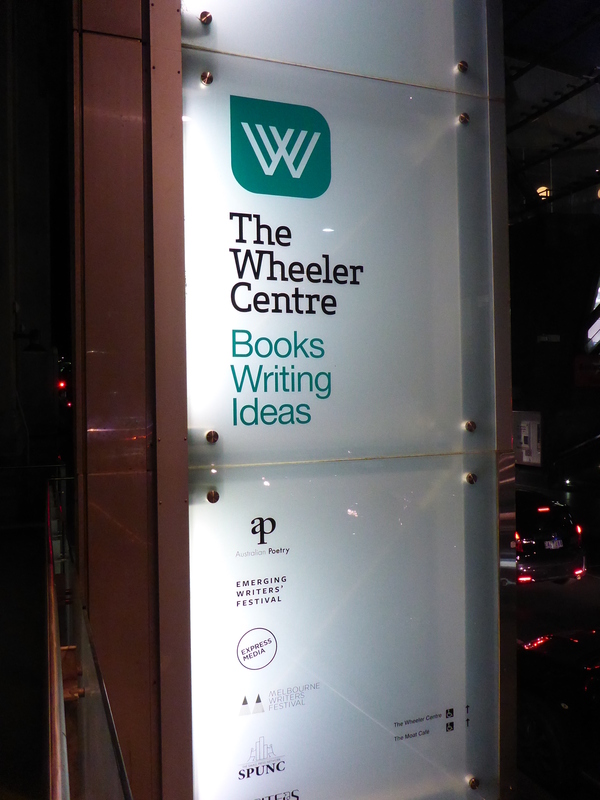 Image Description: a lit sign positioned outside of The Wheeler Centre, it consists of multiple-panes of glass, upon the first pane of glass is the logo for the Wheeler Centre, below the logo there is text on the sign which says, “The Wheeler Centre. Books Writing Ideas”, on the second pane of glass is a collection of logos that indicate a number of writing-orientated organisations that reside within the upper floors of The Wheeler Centre. Image Description: it’s a display sign for the Emerging Writer’s Festival. The background of the sign consists of blue buildings in various shades of blue, with the occasional pink object in the back ground to add contrast, for example: there is a pink flower at the bottom of the sign, pink petals from the flower are scattered across the bottom of the poster. 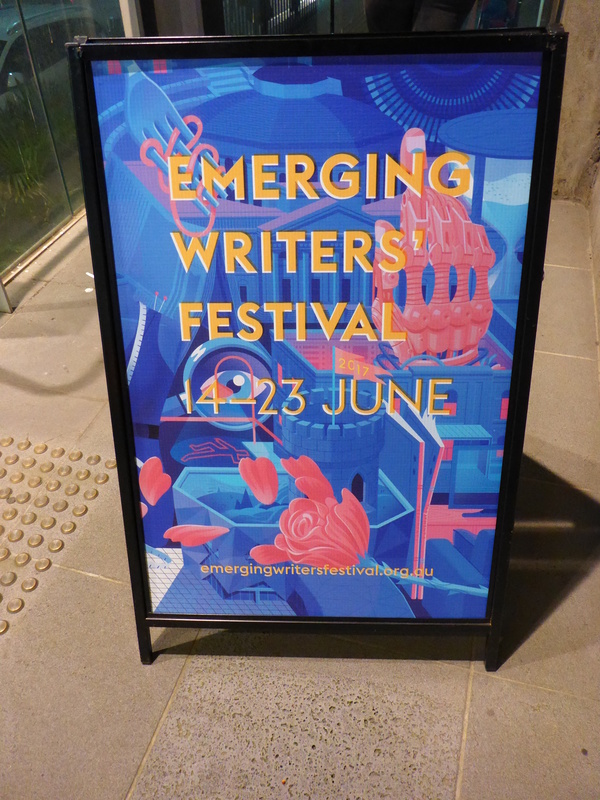 There is yellow text superimposed on top of the blue and pink background, the yellow text is “EMERGING WRITER’S FESTIVAL 14-23 JUNE”. While completing my Bachelor of Creative Arts Industries, there was a unit available known as Radio Production, which was something I was interested in pursuing. Unfortunately, Victoria University doesn’t have a University Radio Station set-up like RMIT does (in fact we had a field-trip to SYN Media to check it out), so my unit lacked that much needed practical experience element. During one of the lectures, we had a guest speaker come in and talk to us about podcasting, while I can’t remember much of the person himself, I can remember the intimidating feeling he gave me as he listed all of the very expensive equipment he felt was necessary in order to produce a high-quality podcast. Despite the reassurances of some of my class-mates, who had created podcasts themselves, that such expensive equipment wasn’t a mandatory requirement, I still had my doubts. After all, I had tried and failed at so many projects previously, was podcasting worthy of the time and money I would need to invent into it? To be honest, I don’t have a lot of knowledge or experience with Audio Equipment, although I have been doing some research into it, and I have been tossing up the idea of either starting up my own podcast series or perhaps starting up my own YouTube Channel. I ultimately decided I needed more information on both subjects and chose to attend the Writer’s Night School: Podcasting event. My teacher and host for the evening was Honor Eastly and it took nearly all my limited self-control not to make an Avatar: The Last Airbender joke (I managed to convince myself that she’s most likely heard them all already). She’s created and been involved in many various art projects, but the podcasts she predominately talked about were Being Honest With My Ex and Starving Artist. Honour talked about Content, Craft and Audience, however, the main topic of choice was Craft, which can be broken down further into Interviewing, Gear, Editing, and Narration. During the University unit, I was able to get some interviewing experience as Victoria University arranged for us to interview staff at Western General Hospital (I interviewed a gentleman who worked as an interpreter). It was a positive experience and I would be considering creating an interview-style of content, however, there is a potential road block to that particular style of narrative. How do you go about getting people to agree to an interview with you? I would image this would be especially difficult if you’re just starting out. But contrary to what I thought (which was simply cold-calling people), Honour put forward her method, which was emailing contacts. Honour also recommended being as transparent as possible about the interviewing process, which included a pre-interview over the phone before meeting the interview subject to clarify what questions she would be asking and establish which directions she intended to take the interview. Honour emphasised that the key to good interviewing was making sure to value time of other people. Next, we moved onto Gear and Editing, which I was interested in finding out more about. During my time at VU, we used Zoom H2N Handy Recorder, they were okay (sound quality was good and relatively simple to use) but the interface was a pain in the arse. If I were to invest in audio recording equipment it would probably be the Zoom H1 (if anyone has some experience or feedback to offer, please feel free to do in the comment section). When it comes to software, my unit teaches recommended Audacity, mostly because it’s free, however, this software made me want to pull my hair out and cry, so now I refuse to use it. I previously had a student subscription to the Adobe Creative Cloud, which has the program Adobe Audition, which works like a dream, so I highly recommend Audition (if you can afford it). If not, there is another alternative that Honor suggested, which is Reaper. I’ve never used Reaper before, so if readers want to leave feedback in the comment section below, please feel free to do so. Honor also recommended Trint, which is a paid Transcription service she uses but is also happy to recommend to others and I figured, regardless of whether I decide to pursue podcasting or a Youtube Video channel, this could be helpful for me either way. Unfortunately, this meant that we didn’t have a lot of time to talk about Audience, however, Honor did have some good advice, such as “Make something people want to hear, give them something, so that they gain something by listening.” and “The best marketing plan is the one you can achieve.”. Although Honor was quick to point out that a component of her success with podcasting was good timing and consistent content releases (once a week being optimal for a singular podcast project). All in all, it was a fun evening learning about something new, but I’m still uncertain as to whether or not pursue podcasting, however, I have decided that I shall investigate my local community radio station and take from there. So my dear readers, are you involved with a podcast? 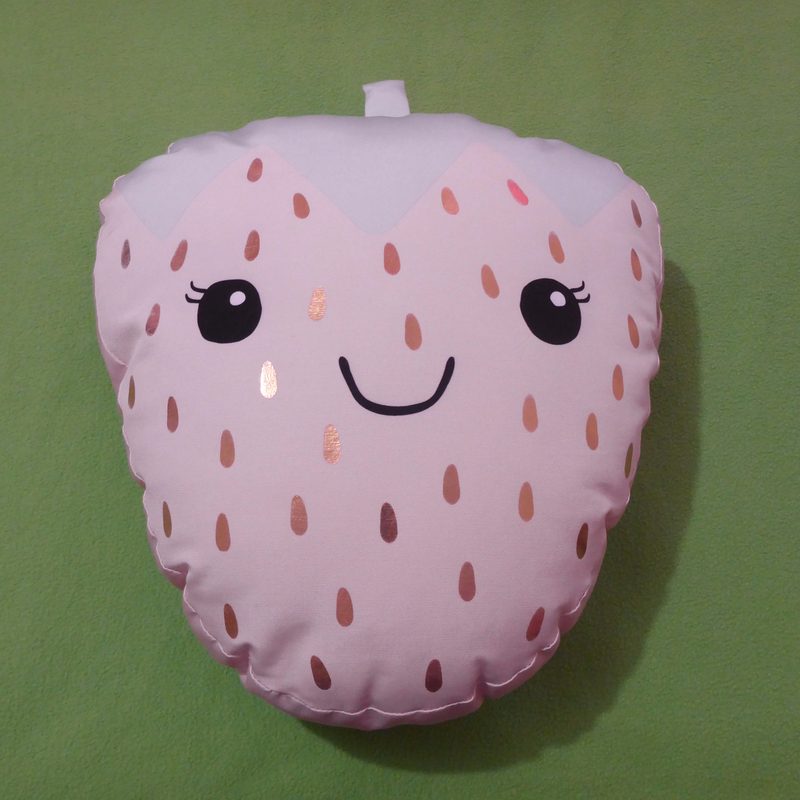 What’s it about and what is/was your experiences like making it? Was it a singular project or a team effort? Let me know in the comment section below.